11 ounce mug manufactured in 1991 in Korea. 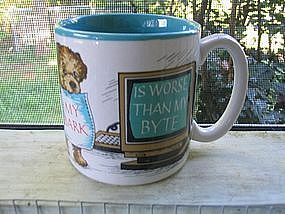 A puppy is carrying a printout that says "My Bark is Worse than My Byte." I believe this is designed by the same Joanne Fink, who also does greeting cards and other design work. There are no chips, cracks or breaks. There is still glue residue from a label on the bottom, which is easily removed. The box is in dreadful condition. I need your zip code to calculate the postage.